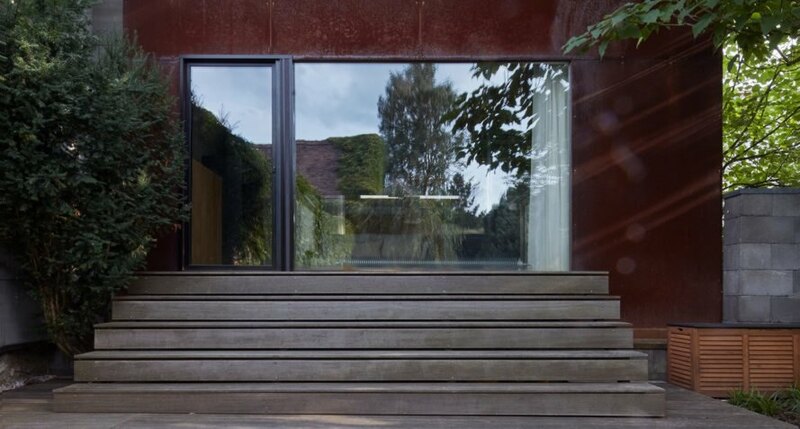 Exposed raw steel wraps around this small house in the Czech Republic, renovated by OK PLAN ARCHITECTS. 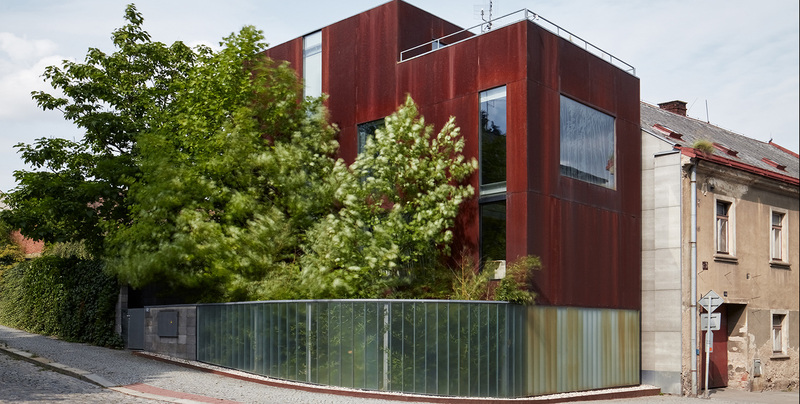 Covered with a vibrant layer of pre-rusted sheet metal (CorTen), the Rusty House is a minimalist residence that surprises passersby with its unusual exterior and layout maximizes the potential of its tiny plot. After living in the house for twelve years, the owner decided to renovate the interior of the house and “soften” the appearance of the main living space. OK PLAN ARCHITECTS helmed the renovation process which included landscaping the surrounding garden. Exposed concrete, galvanized steel and corrugated sheet metal dominate the house. The architects added layers to the interior, including oak ceiling panels, in order to improve the organization of the interior and its acoustic performance. Custom-made furniture and fixtures were added to bring an element of modernity to the place. Older kitchen cabinets were replaced, and a new fireplace installed in the living room. The architects blended the old and the new to respond to new functional and aesthetic demands, while preserving the rawness of the original structure. Fabulous! This would be a terrific addition to a desert environment in the Southwest of the US. After living in the house for twelve years, the owner decided to renovate the interior of the house and “soften” the appearance of the main living space. OK PLAN ARCHITECTS helmed the renovation process which included landscaping of the surrounding garden. Exposed concrete, galvanized steel and corrugated sheet metal dominate the house. 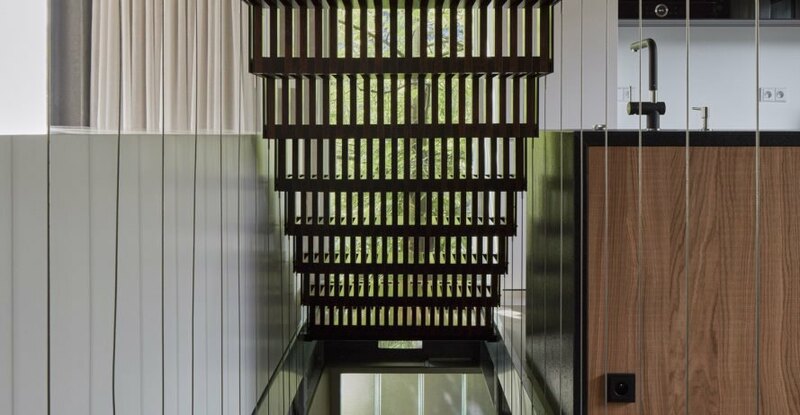 The architects added layers to the interior, including oak ceiling panels, in order to improve the organization of the interior and its acoustic performance. Custom-made furniture and fixtures were added to bring an element of modernity to the place. Older kitchen cabinets were replaced, and a new fireplace installed in the living room. The architects blended the old and the new to respond to new functional and aesthetic demands, while preserving the rawness of the original structure.